EndNote software is available for CDU staff and students. The current version is X9 (or version 19) for Windows and Macintosh. Staff can install the latest version of EndNote for Windows via the "Software Center" option: look for Thomson Reuters EndNote X9. You should also remove any previous versions of EndNote before installing EndNote X9. These should be saved into the folder where the EndNote styles, filters and connection files have been stored (usually in the Program Files folder on the C Drive for Windows or the Applications folder for a Mac). After downloading the EndNote software you also need to add the CDU referencing styles - particularly if using CDU-Harvard Reference style. Click the 'cdu styles' link above to download reference styles. Choose ‘open with’. Double click on the CDU styles 2019 folder and copy all the styles. If you have been using CDU Harvard please download the recent styles folder in order to get the most up to date styles. You must insert the style files in the correct folder where your copy of EndNote has been installed. For Windows, this will usually be C:\ProgramFiles\EndNoteX9\Styles. Look in the EndNote X8 folder in Applications if you have a Macintosh. If you do not save the styles correctly you will not be able to access them from the Import Manager when using EndNote. Once you have saved the CDU styles (same goes for filters and connections) you need to set preferences to point to the correct folder. In EndNote, click on Edit on the toolbar. From the dropdown menu select Preferences. 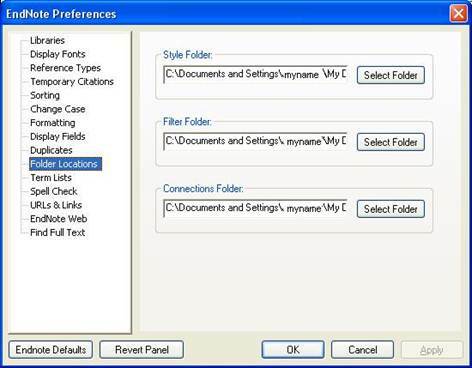 When the EndNote Preferences window opens, click on Folder Locations on the left-hand side. EndNote is a Bibliographic Management tool which allows you to add references manually or automatically from Library databases to your EndNote Library. EndNote allows you to organise your research and collect your citations into a searchable library which can be accessed via the EndNote software and via a cloud-based version. As you write your essay or thesis references can be inserted in-text in the Word document and your Reference list is created at the end of the document. It is also possible to create an EndNote Online account giving you access to a cloud-based Library wherever you are. The original desktop Library can be set to synchronise with the cloud-based account therefore keeping both versions up-to-date. This semester we are asking students to give their feedback on library sessions they attend. The information is anonymous and helps greatly with ensuring we are meeting students needs in training sessions. There are only 6 questions and should only take a few minutes of your time.